Outdoor seating for brunch at Verbena. Photo courtesy Verbena. 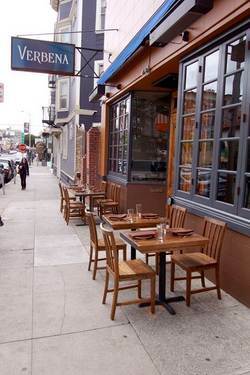 ~VERBENA~ on Polk Street is now serving brunch on Saturdays and Sundays, starting April 5th. The menu offers seasonal dishes, many of them with a twist on the usual selections, including a pork trotter terrine with fried quail eggs and chile oil, and poached eggs with duck ragout and peas. Take a look at the current menu here. They’re also pouring brunch cocktails, like the Verbena mimosa with orange bitters and Cocchi Americano, and of course a Bloody Mary. Brunch is served from 11am-2:30pm, and you can also enjoy outdoor seating on sunny days.